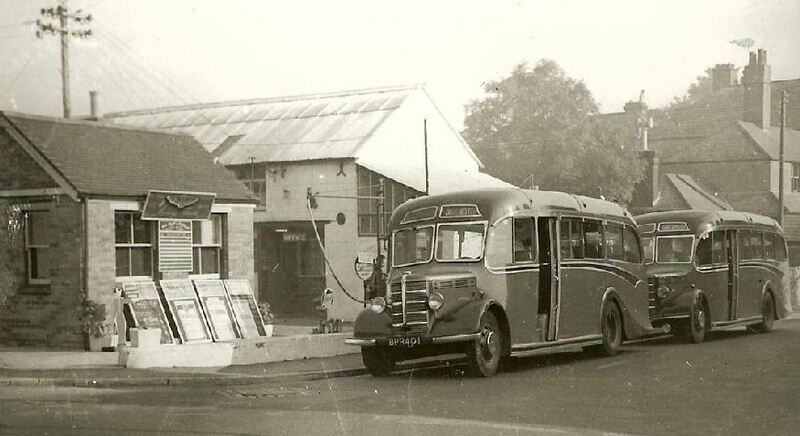 Two of the ten Bedford OB / Duple 29 seaters bought new in 1946 lined up outside the firm's offices at Bridport Road, Dorchester. BPR 401 leads, and was in the Bere Regis fleet from August 1946 until January 1960. 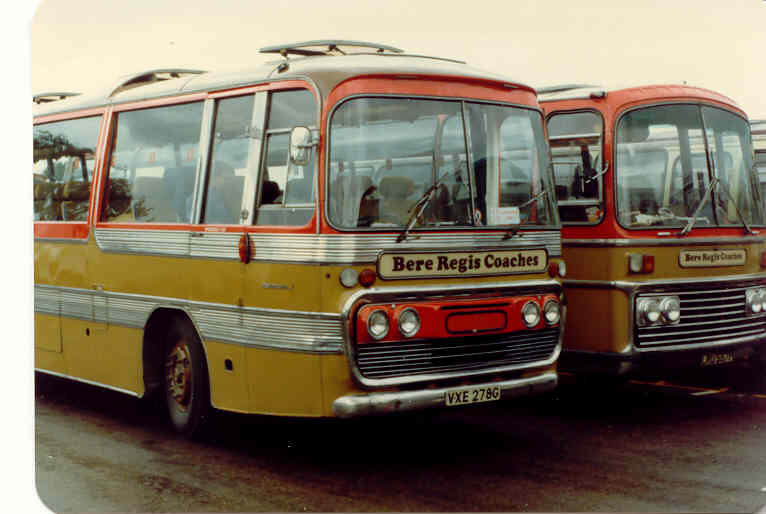 The classic Bere Regis coach of my childhood years. A Leyland PS1 with Gurney Nutting 35 seat body, seen here in Top o'Town car park, Dorchester. Bought new in July 1950, EFX 39 served until January 1963. (Gurney Nutting was a south London body builder better known between the wars for making car bodies for Rolls Royce and Bentley chassis; post-war there was a brief foray for a few years in building bodies for passenger coaches). 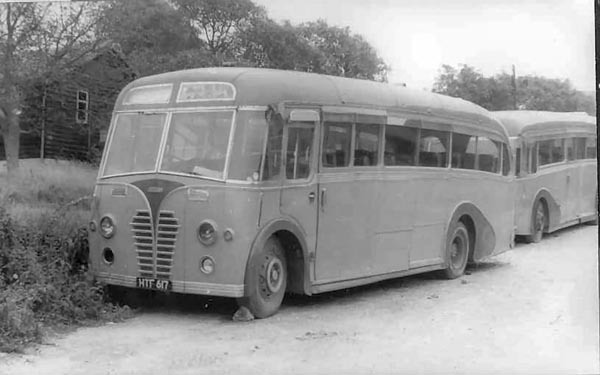 Leyland PS1 HTF 617 with Harrington 35-seat coach body, seen parked in Dorchester in August 1965. Bought from Silver Grey of Morecambe in 1956. Seen here in Trinity Street, Dorchester in July 1993, GRP 922N is a Bedford YRQ 45-seater, operating the town service as can be seen by the signwriting. Originally new to United Counties in 1974, GRP replaced the ex-House of Hilton Ford that was originally used on the town service, with the Ford then transferred to the Blandford to Sturminster Newton route. Ex-Hants & Sussex FCG527 arrives in Dorchester from Bere Regis. Acquired in May 1950, this was a Leyland PD1 with Northern Coachbuilders 55-seater lowbridge body, and was new to Hants & Sussex in 1947. It was one half of a pair, the other being FCG526, acquired June 1949, also from Hants & Sussex, and sold in 1960, whilst 527 was scrapped in the same year. 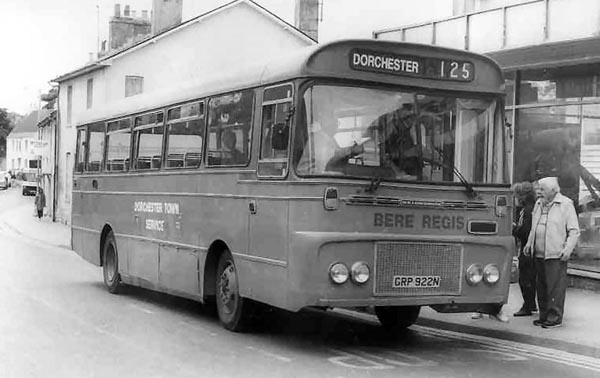 Seen at the foot of High East Street, Dorchester, OED 11 is on the Bovington service - despite the 'Private' showing on the blind. 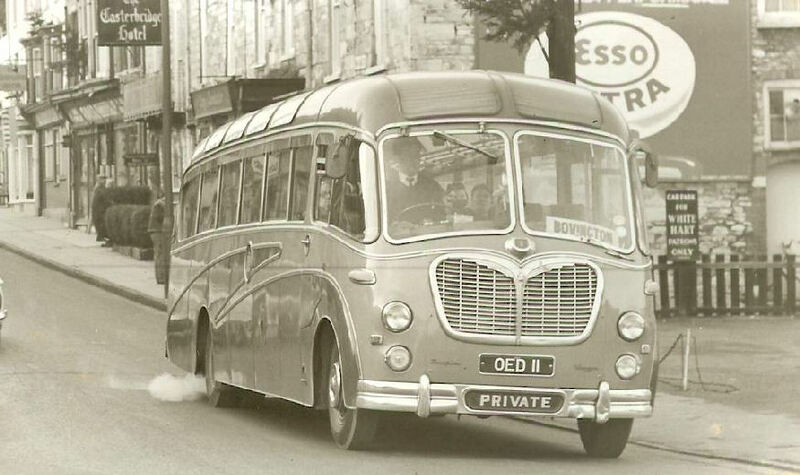 This is a Bedford SBG petrol engined chassis with 41 seat Duple body. 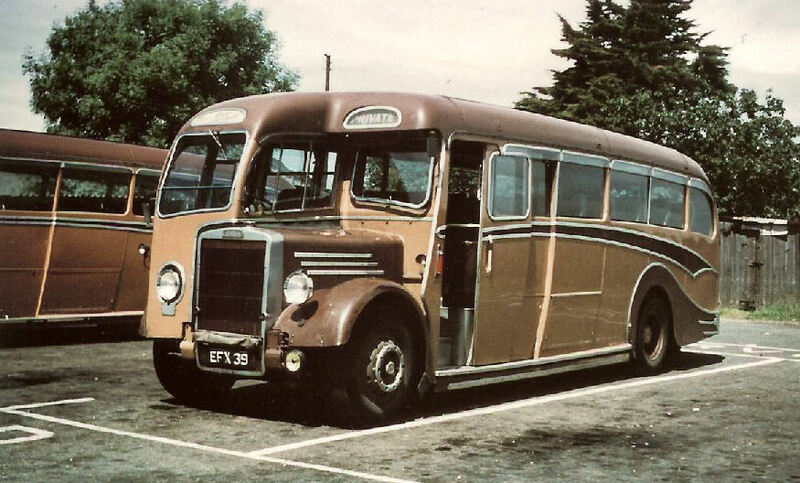 New in 1955 to Shadwell of Warrington, and acquired by Bere Regis in 1962, where it was in service until 1972. VXE 278G, a 1969 Leyland Panther / Plaxton 51 seater, acquired from a Cornish operator in 1981. Standing alongside is LRU 557P, a Bedford YRT / Plaxton 53 seater, bought new in 1975. LCB 928P, one of a pair of 1976 Bedford SB5 / Plaxton 41 seaters acquired in 1980 from Faircough of Radcliffe. The other was LCB 927P. Looking rather lonely is RLJ 187R, a Bedford YMT / Plaxton 53 seater, one of five such coaches bought new in 1977. 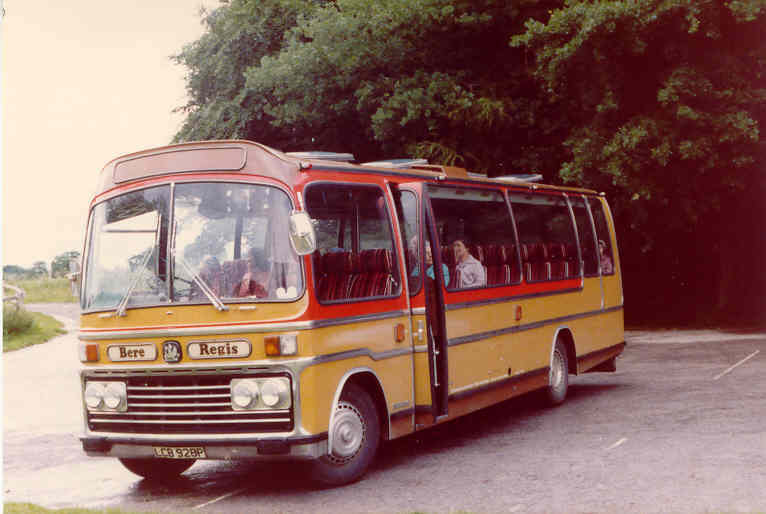 Five Bedford YRT / Plaxton 53 seaters had also been purchased new two years earlier in 1975. 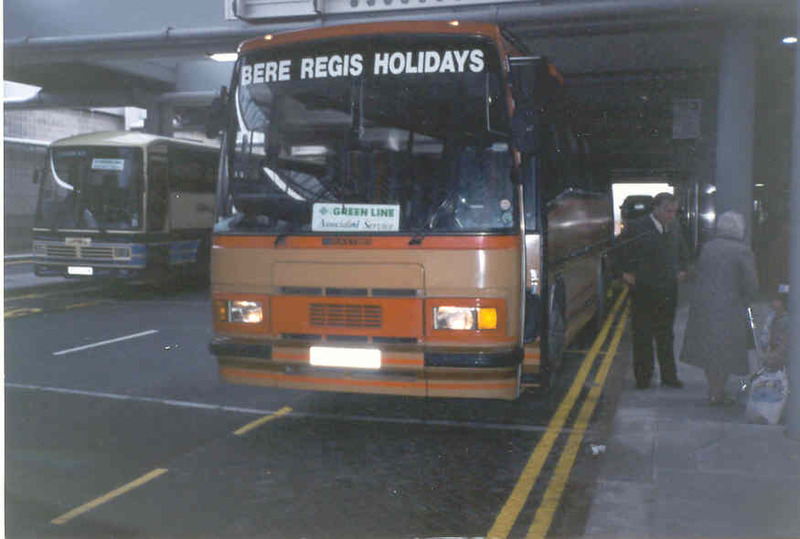 The first arrival at Bulleid Way, London Victoria, of the Dorset to London express coach service introduced in June 1983. H443 JLJ, Volvo B10M / Plaxtons 57 seater. 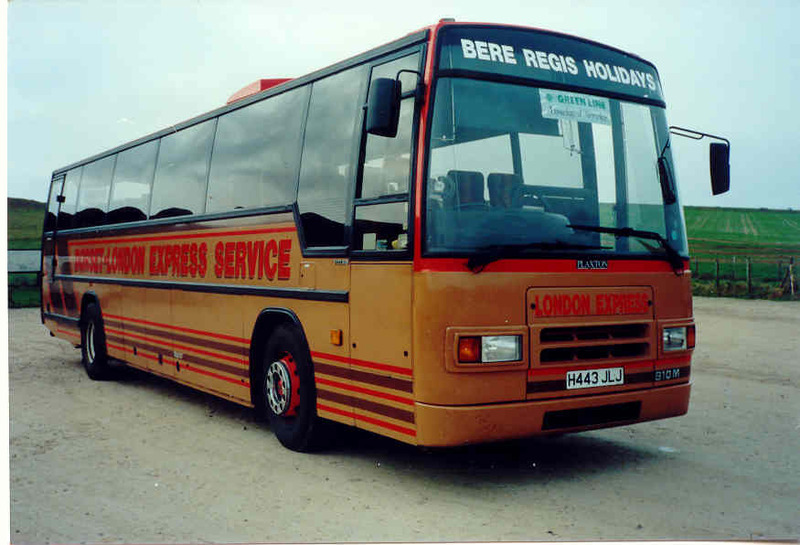 Bought new in 1990 it was the regular performer on the London express service. 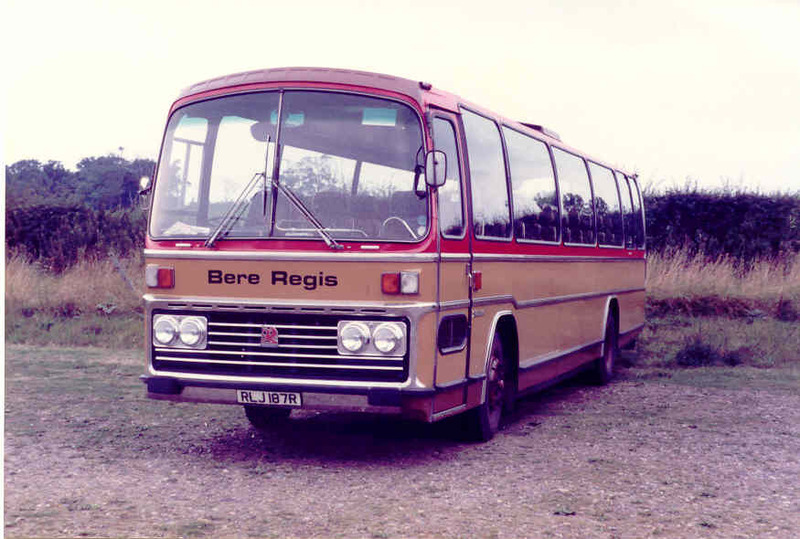 Colin Hallett remembers his days at the Sherborne depot in the 1980s - Coached the Bere Regis way. Another selection of pictures (by Malcolm Knight) can be found here.